The Complete Wave Motion Demo shows how waves propagate and combine. Based on research done at Bell Laboratories, the design of this multiple rod demonstrator allows all the fundamental aspects of wave theory to be expressed in an effective manner. Students can use this apparatus to investigate the behavior of mechanical and electromagnetic waves. Teachers use the demonstration's three sections together or separately to illustrate the principles of wave propagation, reflection, and transmission or for explaining interference, resonance, and standing-wave phenomena. Each of the demonstrator’s three sections consists of a large A-frame base with an array of steel bars attached, equally spaced pivots, and a longitudinal torsion spring. Two of the sections are 92 cm long, and the third section is 60 cm long. The bars on one of the 92 cm sections are 46 cm long for slow-wave propagation velocity. 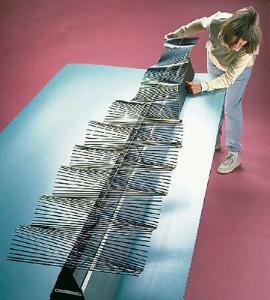 The other wave section has 23 cm bars for fast-wave velocity only. The third and shorter section operates like an impedance-matching transformer because its bars taper exponentially from 46 cm to 23 cm. All the bars have yellow tips, so students can view them from the side. The base folds flat for easy storage. Ordering information: This demo includes a clamp for rigid termination, dash pot for damping reflections, two couplers for connecting the sections, and complete instruction manual.